The little yellow message in the upper right corner of your Google Analytics report can be somewhat unsettling. It appears when you use custom segments on a website has grown to hundreds of thousands of hits. The message is a warning you that the report you’re looking at is based on sampled data. Does this mean the data is wrong? Can you use it to make decisions about your site? Can you share it with your boss? In my article Everything’s Bigger In Texas: Sampling & Google Analytics Reports, I’ve drawn three conclusions that, if kept in mind, will make sure your reports are telling you the truth about your website — or something close to it. The percentage of pageviews that Google Analytics reports in the yellow box can tell you how accurate your report may be. The more data that Google has to analyze, the longer it takes. So, if your report covers a larger the time, the sample size Google Analytics uses will be smaller. For certain types of reports, you’ll be limited to 90 days. If the number of datapoints in your segment is low, you will find the data in your reports to be less accurate. A report with on a segment with 50,000 sessions that is sampled may produce nothing but noise. I show you how to determine this in the column. The larger your sample size, the more you can rely on Google’s reporting because the bigger the sample, the clearer the picture that analytics will be able to make using the data. When your website grows beyond a certain point, Google Analytics is going to start taking shortcuts. [pullquote]Don’t be the victim of a big Google Analytics lie[/pullquote]. Know what those shortcuts are and know how to get around them so that you are relying on data that tells the true story. Are you blind because your Google Analytics setup has blind spots? Do you know when one of your visitors gets a 404 error? You should. Do you know how your overlay popups affect conversion? They really should know. Is Live Chat helping or hurting your sales? You should know. These are three of the most common blind spots we see when setting up analytics for our clients. Find out exactly how to remove these blind spots in your analytics data. We have a recipe for setting up Google Analytics when we take on a new client. A few simple things can make all the difference. Like naming your Views so that you can find the right one easily. Or adding a RAW data view so that you can effectively “backup” your Google Analytics information. I address these and a few more setup issues in my most recent Marketing Land Column, A Google Analytics Setup Checklist. 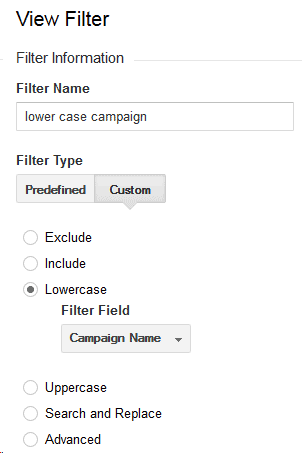 The lower case campaign filter in Google Analytics. 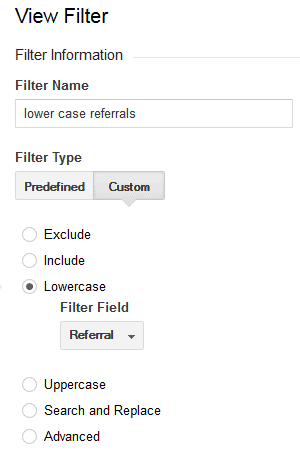 The Google Analytics filter to make the referral field lowercase. The graph above is real. It is the result of more accurately measuring the bounce rate of my blog. Most of us, at one time or another, have not only been frustrated with our bounce rate, but completely puzzled about what to do about it. In my latest Marketing Land article, Using A Google Tag Manager Listener To Get Your Real Bounce Rate, I will guide you toward a more accurate bounce rate. I will walk you through the steps to use The Timer Listener to time the visit duration of each of your visitors and get those percentages down where they belong. A bounce is any visit for which the visitor only looks at one page and does not interact with it. If you’re publishing a blog, this is truly unfair as someone may spend minutes reading a post, and still be counted as a bounce. Find out how to ease some of your bounce rate stress along with the answers to the following questions and more. Does Google Tag Manager (GTM) making anything easier? How can I change the way Google Analytics calculates bounce rate? How do I get that tenacious bounce rate down? Recording your bounce rate more fairly makes you feel better, since your bounce rate should go down. This exercise will give you some experience in playing with GTM’s new listeners. Google keeps messing with us. As soon as we thought we had Panda down, they introduced Penguin. Frankly, we weren’t too excited about the learning curve on that one. Then they threw an invisibility cloak over keywords used in Google searches, which made it even harder to figure out how people were finding us. And now we’ve got Hummingbird to deal with. If your IT guy or gal is adept at second-guessing Google algorithms and tricking Google into finding you, Hummingbird might not be a welcome upgrade. But if you’ve been posting useful, keyword-rich content on your website, cultivating high quality link-building and participating on social platforms in a thoughtful way, you’re in luck. By complying with basic SEO strategies, you will find that Google is trying to help businesses like yours come out ahead. [pullquote position=”right”]Both experts and high-growth firms agree that SEO is the most effective online marketing tactic for generating online leads[/pullquote]. And now, Google is enhancing their search capability so that businesses and prospective customers can find each other faster. In this new, more organic type of search, Google is inserting itself into (and making judgments about) your website’s online relationships. It used to be that you could pay, trade or beg anyone to link to you, thereby improving your page rank. The more links the better, even if the originating sites were questionable or you had hired a troll to sit in a backroom and post comments (and your link) on a thousand blogs. Google didn’t like that. With the introduction of “no follow links” and the ability to better identify “spammy” sources, spraying links throughout the Internet not only stopped working, it started costing you. Page rankings got spanked when search engines identified link-backs as originating from unsavory sites, unrelated content or artificially populated social platforms. Roll forward to 2014. Today, high quality link-building is even more dependent upon good content. Relevance is key. The bloggers, articles, websites and publications that are linking back to you should somehow relate to the services you provide. And they should be coming from industry sources you’d be proud to hang out with. So how do you inspire these like-minded folks to send their followers to you? The first step in developing your high quality link-building strategy is to find out what types of people and online sources would be most appropriate for—and interested in—linking back to you. You may already know who they are, but if you need help, check out Open Site Explorer. This free tool enables you to see who’s linking to your competitors. Most likely, you will want these folks (or people like them) linking to you as well. Next, create well-crafted content which provides information, tools and thought-leadership that will appeal to the people you want linking back to you. And finally, raise a ruckus about it. Make sure that influential bloggers, industry-specific publications, social sites and prospective customers are alerted to and have easy access to your e-books, webcasts, slideshows, blogs and of course, your interactive, easy-to-navigate website. In short, establish yourself online as a foremost authority in your field. By establishing yourself as a “go-to” industry expert, your leadership position will be noted by your peers and prospective customers, and ultimately by search engines that will reward your credibility by boosting your page rank. Pitch your content to relevant publications and be sure to include a “resource box” that contains your bio and website link. Target online media outlets that your customers rely on for information. Start a blog. (And don’t forget the part about actually writing in it—at least once a week.) 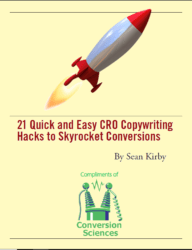 Make sure each entry is a quick, easy read that provides useful, keyword-rich content. Encourage your readers to share it. Build relationships with other bloggers in your industry by directing them to your blog, inviting them to post and guest-posting on theirs. Populate select social media channels with links to your cool stuff. When people “like” your content, retweet your tweets and otherwise direct their friends, fans and followers to your site, Google recognizes this as a vote of confidence and favors you in their searches. Although it takes awhile to create a strategic presence on social media platforms, it’s one of the best ways to boost your high quality link-building campaign. These ideas should help get you started. And don’t forget—relevance is key. Be wary of aggressively seeking link-backs at the risk of compromising the quality of your connections. What search engines are aiming for in 2014 and beyond is to create authentic relationship between those who are seeking and those who have something to offer. Be patient. Like any good relationship, it takes time to build. Sylvia Montgomery is a Senior Partner at Hinge, a marketing and branding firm for professional services. At Hinge, Sylvia provides strategic counsel to national clients. She is a co-author of Inside the Buyer’s Brain and Online Marketing for Professional Services. You can follow Sylvia on Twitter @BrandStrong. Marketing Batteries: These are powerful online devices that can actually store attention. Marketing batteries get charged up on the attention that you pay for by running ads, by investing in SEO, by doing press releases, by blogging, by creating webinars. All you have to do is tap into them after they are charged. Customer Batteries contain the energy of those who bought from you. Subscriber Batteries contain then energy of those who have subscribed to your lists. Then there are Social Batteries, that store the energy of those who have like, followed, connected, plussed or pinned you. These batteries are easy to charge, but hard to get a current out of. There has always been a gap between reliable Subscriber Batteries and skittish Social Batteries. Until now. Google (and other ad networks) can keep track of those who have visited your site, but didn’t buy, subscribe, or like you. When a visitor comes to your site, a cookie is set in their browser. Then Google keeps a list of these visitors, and watches for that cookie when someone comes to another site. When Google sees that a person has been to your site, they can run one of your ads. It works, and retargeted ads perform quite well compared to regular text and banner ads. Not everyone who comes to your site is qualified to buy your product or service. Some came there on accident. Others were looking for something else. Google smart lists seeks to identify those visitors who are more likely to be actually interested in your product. Last week, the tech savvy site announced the launch of a new type of remarketing list in Google Analytics called Smart Lists. Simply stated, Smart Lists predict which users are most likely to convert during a later visit. Based on their on-site actions, Analytics is able to regulate your remarketing campaigns to align with each user’s value, according to the specific company. Now when creating a new remarketing list, you’ll have the option to have Analytics manage your list for you – automatically. Smart List is a great way to get started with solid performance results. As you get comfortable with remarketing, you can modify your ads and apply a variety of remarketing best practices. You are most likely employing a sophisticated list strategy already. Google is aware of this and gearing up to extend this signal directly for your current lists as an optimization signal used in AdWords bidding. According to Google, they will be continuing to iterate on these models in order to help users better understand and act on their data. They are also working on surfacing these signals elsewhere in your reports and in the product so you can dive into what factors help predict whether a user will likely convert. We have a new kind of Marketing Battery: The Visitor Battery. Simplify the decision making process of creating remarketing lists with “Smart Lists with Google Analytics”. For more information on Remarketing with Google Analytics, visit here. Presidents day is a great day to talk about money, because so many of our most awesome presidents are on US bills. If you’re on a bill, you are the president of legal tender in our book. When we think of the kinds of data we use to make decisions, there is $1 marketing math and there is $100 marketing math. You have to get comfortable with the $1 math before you can move on to $5 math. Don’t worry, our presidents are here to help you. At the $1 level you have basic numbers about your site. We call these analytics because it makes us sound smart. Knowing what is going on with your website requires the same discipline that GW brought to the office of the president, a level of discipline and ethics so impactful, that no president since has bothered to repeat it. “Traffic” is measured in Visitors, who generate many Visits and there can be many Pageviews for each visit. You may think you want traffic to go up, but you might be wrong. “Revenue” is the measure of dollars generated directly online. You usually want this to go up. “Profit” is the measure of dollars you put in the bank from online purchases. You always want this to go up. “Transactions” are the measure of how many times someone buys on your site. We don’t count recurring subscription charges as transactions. “Leads generated” are the equivalent of transactions for those of us that don’t do transactions online. Form fills and phone calls are typically measures as leads. “Sales Close Ratio” tells us what percentage of leads turn into clients. If you have a long sales cycle, it can be estimated as # new customers per year / # new leads per year. “Average Customer Value” tells us what a customer is worth in a lead generation scenario. It can be the average value of the first contract, the estimated lifetime value of a client, or even the lowest possible contract for the most conservative value. It is more important to consistent than accurate. At the $5 level, we begin to understand the impact of a successful online transaction on our business. If we can calculate the value of a conversion, it’s not hard to make better decisions about getting more conversions. Unfortunately, Alexander Hamilton was never elected president, and ruins the premise of this infographic. Aaron Burr expressed his dissatisfaction as completely as we could by gunning him down in a duel. Your $10 math problem is Conversion Rate. Andrew Jackson was the trouble-maker president, and perfect for the $20 math problems. These are trouble-making stats because they don’t hide the truth of what is going on with your site. Revenue per visit (RPV) tells us exactly how much money we’re making every time someone visits our site. If you increase your conversion rate by reducing your prices by 50%, RPV will reveal your Jacksonian folly. Our $50 math looks at the dark side of eCommerce, like U.S. Grant did during the Civil War. These metrics can be very helpful. Don’t take them for “granted”. This heartbreaking stat shows us all the people who started checking out, and never made it through. Oh, the humanity. If your “CAR” is going off a cliff it means your visitors are leaving items in their cart and leaving. Imagine if this happened at your grocery store. Yet another bill with a non-president on it. Nonetheless, many a famous rap song has been written about getting more “Benjamins.” We like them, too. Franklin was an inventor and tinkerer, and our $100 math level is about segmenting. Different people behave differently on your site. All of the above should be calculated for the important segments of your business. Which methods of segmenting make sense for you? Will “new” visitors behave differently than “returning” visitors? Do you have a large number of Mobile visitors? if so, is their RPV higher or lower than desktop visitors? Does PPC traffic have a higher RPV than Organic traffic? Is email traffic have a lower abandonment rate? When you’re asking these questions, you have to be a frank as Franklin. Where are you in your marketing math journey? Which of these things are you looking at every month (or more often). Are you just getting some George Washington discipline or are you asking segmenting questions that bring the Benjamins? Have you looked at the bad news of abandonment rate? Your success depends on making high-dollar decisions. With the right numbers, you can go form being Alexander Spamilton to Benjamin Bankin.